If all forces do not line up with your axes, resolve those forces into components using trigonometry (note that the formulas below only work if the angle is measured from the horizontal). As an example, picture a glass of soda sitting on the dining room table. You can represent the glass of soda in the diagram as a single dot. Then, represent each of the vector forces acting on the soda by drawing arrows and labeling them. In this case, you can start by recognizing the force of gravity on the soda, known more commonly as the soda’s weight. Although you could label this force as Fgrav, or W, get in the habit right now of writing the force of gravity on an object as mg. You can do this because the force of gravity on an object is equal to the object’s mass times the acceleration due to gravity, g.
Of course, since the soda isn’t accelerating, there must be another force acting on the soda to balance out the weight. This force, the force of the table pushing up on the soda, is known as the normal force (FN). In physics, the normal force refers to a force perpendicular to a surface (normal in this case meaning perpendicular). The force of gravity on the soda must exactly match the normal force on the soda, although they are in opposite directions, therefore there is no net force on the soda. The free body diagram for this situation could be drawn as shown at right. 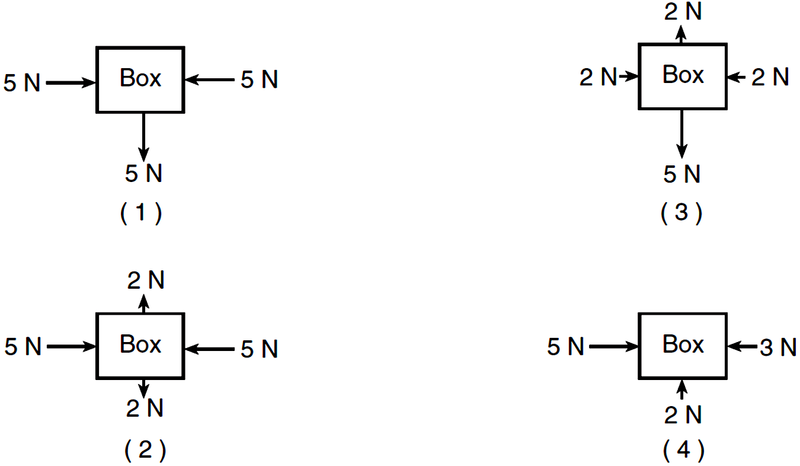 Question: Which diagram represents a box in equilibrium? Answer: (2) all forces are balanced for a net force of zero. Answer: (4) continue moving with constant velocity in accordance with Newton’s 1st Law of Motion.